Blog Post by Stefaan G. Verhulst: “…The value of data collaboratives stems from the fact that the supply of and demand for data are generally widely dispersed — spread across government, the private sector, and civil society — and often poorly matched. This failure (a form of “market failure”) results in tremendous inefficiencies and lost potential. Much data that is released is never used. And much data that is actually needed is never made accessible to those who could productively put it to use. Data collaboratives, when designed responsibly, are the key to addressing this shortcoming. They draw together otherwise siloed data and a dispersed range of expertise, helping match supply and demand, and ensuring that the correct institutions and individuals are using and analyzing data in ways that maximize the possibility of new, innovative social solutions. Despite their clear potential, the evidence base for data collaboratives is thin. 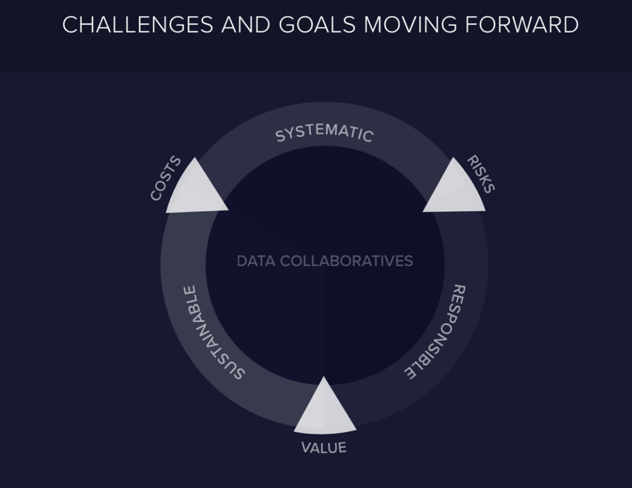 There’s an absence of a systemic, structured framework that can be replicated across projects and geographies, and there’s a lack of clear understanding about what works, what doesn’t, and how best to maximize the potential of data collaboratives. At the GovLab, we’ve been working to address these shortcomings. For emerging economies considering the use of data collaboratives, whether in pursuit of Artificial Intelligence or other solutions, we present six steps that can be considered in order to create data collaborative that are more systematic, sustainable, and responsible. LinkedIn: “The World Bank Group and LinkedIn share a commitment to helping workers around the world access opportunities that make good use of their talents and skills. The two organizations have come together to identify new ways that data from LinkedIn can help inform policymakers who seek to boost employment and grow their economies. This site offers data and automated visuals of industries where LinkedIn data is comprehensive enough to provide an emerging picture. The data complements a wealth of official sources and can offer a more real-time view in some areas particularly for new, rapidly changing digital and technology industries. The data shared in the first phase of this collaboration focuses on 100+ countries with at least 100,000 LinkedIn members each, distributed across 148 industries and 50,000 skills categories. In the near term, it will help World Bank Group teams and government partners pinpoint ways that developing countries could stimulate growth and expand opportunity, especially as disruptive technologies reshape the economic landscape. As LinkedIn’s membership and digital platforms continue to grow in developing countries, this collaboration will assess the possibility to expand the sectors and countries covered in the next annual update. This site offers downloadable data, visualizations, and an expanding body of insights and joint research from the World Bank Group and LinkedIn. The data is being made accessible as a public good, though it will be most useful for policy analysts, economists, and researchers….(More)”. Paper by Ivo D Dinov et al: “The UK Biobank is a rich national health resource that provides enormous opportunities for international researchers to examine, model, and analyze census-like multisource healthcare data. The archive presents several challenges related to aggregation and harmonization of complex data elements, feature heterogeneity and salience, and health analytics. Using 7,614 imaging, clinical, and phenotypic features of 9,914 subjects we performed deep computed phenotyping using unsupervised clustering and derived two distinct sub-cohorts. Using parametric and nonparametric tests, we determined the top 20 most salient features contributing to the cluster separation. Our approach generated decision rules to predict the presence and progression of depression or other mental illnesses by jointly representing and modeling the significant clinical and demographic variables along with the derived salient neuroimaging features. We reported consistency and reliability measures of the derived computed phenotypes and the top salient imaging biomarkers that contributed to the unsupervised clustering. This clinical decision support system identified and utilized holistically the most critical biomarkers for predicting mental health, e.g., depression. External validation of this technique on different populations may lead to reducing healthcare expenses and improving the processes of diagnosis, forecasting, and tracking of normal and pathological aging….(More)”. the Estonian Parliament passed new legislation that effectively expanded the number of official tasks for Statistics Estonia. Mägi elaborates: ‘Most importantly, we shall be responsible for coordinating data governance. The detailed requirements and conditions of data governance will be specified further in the coming period.’ Under the new Act, Statistics Estonia will also have more possibilities to share data with other parties…. Yet another ambitious goal for Statistics Estonia lies in the field of data science. ‘Similarly to Statistics Netherlands, we established experimental statistics and data mining activities years ago. Last year, we developed a so-called think-tank service, providing insights from data into all aspects of our lives. Think of birth, education, employment, et cetera. Our key clients are the various ministries, municipalities and the private sector. The main aim in the coming years is to speed up service time thanks to visualisations and data lake solutions.’ …(More)”. Devin Coldewey at TechCrunch: “A new map of nearly all of Africa shows exactly where the continent’s 1.3 billion people live, down to the meter, which could help everyone from local governments to aid organizations. The map joins others like it from Facebook created by running satellite imagery through a machine learning model. It’s not exactly that there was some mystery about where people live, but the degree of precision matters. You may know that a million people live in a given region, and that about half are in the bigger city and another quarter in assorted towns. But that leaves hundreds of thousands only accounted for in the vaguest way. Fortunately, you can always inspect satellite imagery and pick out the spots where small villages and isolated houses and communities are located. The only problem is that Africa is big. Really big. Manually labeling the satellite imagery even from a single mid-sized country like Gabon or Malawi would take a huge amount of time and effort. And for many applications of the data, such as coordinating the response to a natural disaster or distributing vaccinations, time lost is lives lost. Better to get it all done at once then, right? That’s the idea behind Facebook’s Population Density Maps project, which had already mapped several countries over the last couple of years before the decision was made to take on the entire African continent…. The core idea is straightforward: Match census data (how many people live in a region) with structure data derived from satellite imagery to get a much better idea of where those people are located. That’s several times more accurate than any extant population map of this size. The analysis is done by a machine learning agent trained on OpenStreetMap data from all over the world, where people have labeled and outlined buildings and other features. First the huge amount of Africa’s surface that obviously has no structure had to be removed from consideration, reducing the amount of space the team had to evaluate by a factor of a thousand or more. Then, using a region-specific algorithm (because things look a lot different in coastal Morocco than they do in central Chad), the model identifies patches that contain a building….(More)”. Paper by B. Tyr Fothergill et al: “Current discussions of the ethical aspects of big data are shaped by concerns regarding the social consequences of both the widespread adoption of machine learning and the ways in which biases in data can be replicated and perpetuated. We instead focus here on the ethical issues arising from the use of big data in international neuroscience collaborations. Neuroscience innovation relies upon neuroinformatics, large-scale data collection and analysis enabled by novel and emergent technologies. Each step of this work involves aspects of ethics, ranging from concerns for adherence to informed consent or animal protection principles and issues of data re-use at the stage of data collection, to data protection and privacy during data processing and analysis, and issues of attribution and intellectual property at the data-sharing and publication stages. Significant dilemmas and challenges with far-reaching implications are also inherent, including reconciling the ethical imperative for openness and validation with data protection compliance, and considering future innovation trajectories or the potential for misuse of research results. Furthermore, these issues are subject to local interpretations within different ethical cultures applying diverse legal systems emphasising different aspects. Neuroscience big data require a concerted approach to research across boundaries, wherein ethical aspects are integrated within a transparent, dialogical data governance process. We address this by developing the concept of ‘responsible data governance’, applying the principles of Responsible Research and Innovation (RRI) to the challenges presented by governance of neuroscience big data in the Human Brain Project (HBP)….(More)”. Paper by the Bipartisan Policy Center: “Emerging privacy-preserving technologies and approaches hold considerable promise for improving data privacy and confidentiality in the 21st century. At the same time, more information is becoming accessible to support evidence-based policymaking. In 2017, the U.S. Commission on Evidence-Based Policymaking unanimously recommended that further attention be given to the deployment of privacy-preserving data-sharing applications. If these types of applications can be tested and scaled in the near-term, they could vastly improve insights about important policy problems by using disparate datasets. At the same time, the approaches could promote substantial gains in privacy for the American public. Using new privacy-preserving approaches addresses pressing needs in society. Current widely accepted approaches to managing privacy risks—like preventing the identification of individuals or organizations in public datasets—will become less effective over time. While there are many practices currently in use to keep government-collected data confidential, they do not often incorporate modern developments in computer science, mathematics, and statistics in a timely way. New approaches can enable researchers to combine datasets to improve the capability for insights, without being impeded by traditional concerns about bringing large, identifiable datasets together. In fact, if successful, traditional approaches to combining data for analysis may not be as necessary. There are emerging technical applications to deploy certain privacy-preserving approaches in targeted settings. These emerging procedures are increasingly enabling larger-scale testing of privacy-preserving approaches across a variety of policy domains, governmental jurisdictions, and agency settings to demonstrate the privacy guarantees that accompany data access and use. Widespread adoption and use by public administrators will only follow meaningful and successful demonstration projects. For example, secure computation approaches are complex and can be difficult to understand for those unfamiliar with their potential. Implementing new privacy-preserving approaches will require thoughtful attention to public policy implications, public opinions, legal restrictions, and other administrative limitations that vary by agency and governmental entity. This project used real-world government data to illustrate the applicability of secure computation compared to the classic data infrastructure available to some local governments. The project took place in a domestic, non-intelligence setting to increase the salience of potential lessons for public agencies….(More)”. 2. The public and private sectors’ asymmetric capacity to gather data.This is related to citizens using public services less frequently than private services in the new digital channels. However, governments could benefit from the information possessed by private companies. These anonymous, aggregated data can help to ensure a more dynamic public management. Even personal data could open the door to customized education or healthcare on an individual level. In order to analyze all of this, the European Commissionhas created a working group including 23 experts. The purpose is to come up with a series of recommendations regarding the best legal, technical and economic framework to encourage this information transfer across sectors. 3. The lack of incentives for companies and citizens to encourage the reuse of their data.The reality today is that most companies solely use the sources internally. Only a few have decided to explore data sharing through different models (for academic research or for the development of commercial services). As a result of this and other factors, the public sector largely continues using the survey method to gather information instead of reading the digital footprint citizens produce. Multiple studies have demonstrated that this digital footprint would be useful to describe socioeconomic dynamics and monitor the evolution of official statistical indicators. However, these studies have rarely gone on to become pilot projects due to the lack of incentives for a private company to open up to the public sector, or to society in general, making this new activity sustainable.